This scene shows the "Murray Ridge" portion of the western rim of Endeavour Crater on Mars. The ridge is the NASA's Mars Exploration Rover Opportunity's work area for the rover's sixth Martian winter. The ridge rises about 130 feet (40 meters) above the surrounding plain, between "Solander Point" at the north end of the ridge and "Cape Tribulation," beyond Murray Ridge to the south. This view does not show the entire ridge. The visible ridge line is about 10 meters (33 feet) above the rover's location when the component images were taken. The scene sweeps from east to south. The planar rocks in the foreground at the base of the hill are part of a layer of rocks laid down around the margins of the crater rim. 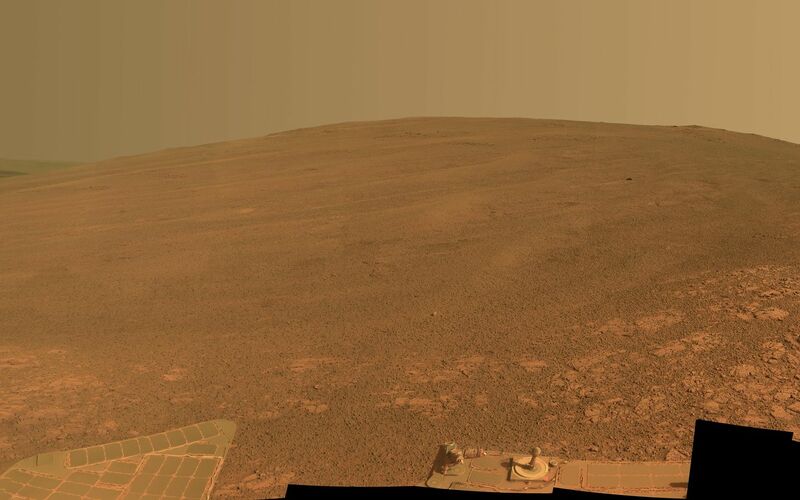 At this location, Opportunity is sitting at the contact between the Meridiani Planum sandstone plains and the rocks of the Endeavour Crater rim. On the upper left, the view is directed about 22 kilometers (14 miles) across the center of Endeavour crater to the eastern rim. Opportunity landed on Mars in January 2004 and has been investigating parts of Endeavour's western rim since August 2012. 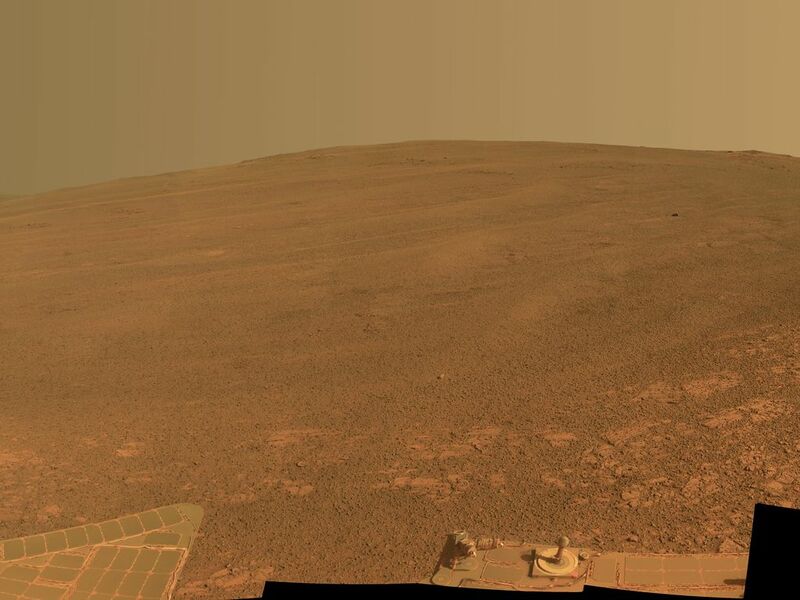 The scene combines several images taken by the panoramic camera (Pancam) on NASA's Mars Exploration Rover Opportunity during the 3,446th Martian day, or sol, of the mission's work on Mars (Oct. 3, 2013) and the following three sols. On Sol 3451 (Oct. 8, 2013), Opportunity began climbing the ridge. The slope offers outcrops that contain clay minerals detected from orbit and also gives the rover a northward tilt that provides a solar-energy advantage during the Martian southern hemisphere's autumn and winter. The rover team chose to call this feature Murray Ridge in tribute to Bruce Murray (1931-2013), an influential advocate for planetary exploration who was a member of the science teams for NASA's earliest missions to Mars and later served as director of NASA's Jet Propulsion Laboratory, in Pasadena. This view is presented in approximately true color, merging exposures taken through three of the Pancam's color filters, centered on wavelengths of 753 nanometers (near-infrared), 535 nanometers (green) and 432 nanometers (violet).